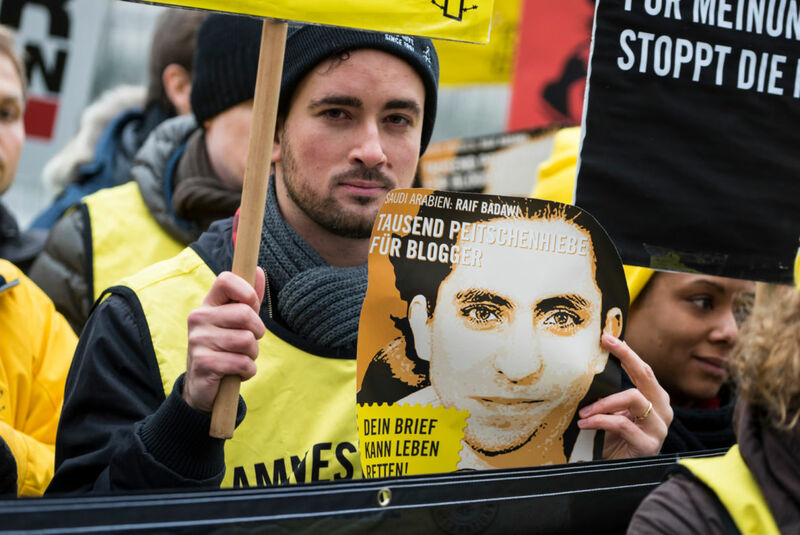 Saudi Arabian blogger Raif Badawi was detained in June 2012 and sentenced in 2014 for setting up a website focused on social and political debate. He was sentenced to 10 years in prison and 1,000 lashes. When Saudi Arabian authorities first flogged him on 9 January 2015, our supporters around the world rose up as one, driving global condemnation of the authorities and demanding the release of Raif Badawi and all other prisoners of conscience. He has not been flogged again since then. Over the past three years, our supporters have tirelessly campaigned outside Saudi Arabian embassies worldwide, held candlelit vigils, fired off tweets targeting the Saudi Arabian authorities, and written hundreds of thousands of letters and solidarity messages demanding Raif and all other prisoners of conscience detained in Saudi Arabia are freed. Now, more than ever, we must keep up the pressure, as the human rights situation in Saudi Arabia is getting worse. We refuse to let Saudi Arabia’s appalling human rights record go unnoticed. The crackdown on civil society and freedom of expression continues unabated as the authorities continue to put human rights defenders on trial on charges related to their peaceful activism. Dozens of outspoken activists, human rights defenders, writers and lawyers remain behind bars, including Raif’s lawyer Waleed Abu al-Khair, simply for exercising their rights to freedom of expression, association and peaceful assembly. But, there’s power in numbers, and we won’t stop until all prisoners of conscience are free. Saudi Arabia is known for being sensitive about its public image and international standing. We encourage you to target officials publicly, shaming them about their repression of freedom of expression and pressuring them to release all prisoners of conscience. In connection with their peaceful activities, human rights defenders continue to be prosecuted on vague, broad charges under the counter-terror law. They can be sentenced to up to 15 years in prison after grossly unfair trials in front of the Specialized Criminal Court (SCC), a notorious tribunal set up to deal with security and terrorism-related offences. Last week, UN experts deplored Saudi Arabia’s use of the counter-terror law and urged it to end the repression of peaceful activists. Your government should be doing all it can to make Saudi Arabia do the right thing. Tweet your government’s official accounts (for example, your Ministry of Foreign Affairs, or your country’s embassy in Saudi Arabia) and ask them to release Raif, Waleed and all prisoners of conscience.